When you use an operating system, you want it to last. And Firebuntu will. 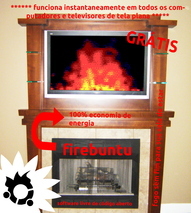 Firebuntu instantly turns any computer into an epic ASCII fireplace. Shipped with up-to-date video drivers it guarantees that it will run on most available TFT screens in highest resolution (preferably in 1920×1080). Once booted you can enjoy endless hours of a more than mesmerizing fireplace. We made sure that no silly screensaver or power option will blank out your screen. Unlike a Windows or OS X, Firebuntu comes with everything you need to relax and have a nice and enjoyable evening with your relatives and friends — all in just a few moments after you take it out of the box. Place your TFT close to your real fireplace for an even more authentic experience. It’s like Zen for your computer!